this is an outstanding photograph. great job on this one!! This is the world famous Navagio Shipwreck beach in Zakynthos, Greece seen through my eyes. 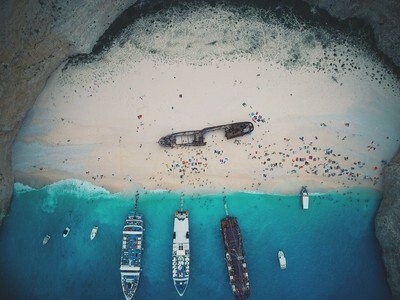 The photo was taken at Navagio Shipwreck Beach in Zakynthos Island, Greece. It was my first trip with a drone, so I was trying to find new perspectives. It was around 1 p.m. ; I remember that I was sooo tired because I woke up at 8 am and never stopped traveling around until something like 6 pm. Tired but happy! I arrived there by ship. While I was getting closer to the beach, I saw it from the distance and thought "it's almost perfectly symmetrical, so I'll try to emphasize that." I used just a DJI Spark, I think it's the most confortable drone for travelling, I had my backpack full of stuff (water, food, swimming shorts etc.) And the drone was small enough to fit in, with all the accessories like remote, batteries, ND filters and landing pad. As already said, I was experimenting new perspectives, because I had never travelled with a drone before and I wanted to try every angle possible, this photo was taken after 2 weeks on the island so I started understanding how to shoot Beach photos and videos. Yes, you won't believe it but the natural colors were way too punchy, so I had to mellow them out a little bit and add a little vignette. Just lowered contrast and nothing else; that island itself has unbelievable colors. It depends on where I have to go. That day I had to travel all day so I had just a little bit of room in my backpack, so I carried just the Spark with accessories and my phone. You have to learn the basics rules of Photography and then you must try, try and try again. Once you know the rules you can even break them, but you have to do it with at least little bit of knowledge, and ALWAYS try to find perspectives that no one has used before. If you know where you will be going take a look at other pictures taken by other photographers and try to find an angle that no one ever found.